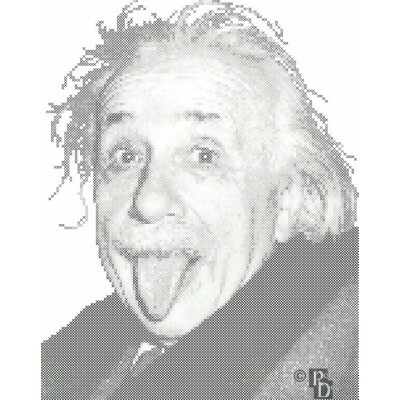 Who doesn't love this picture of one of the world's greatest geniuses sticking his tongue out? The finished picture is in shades of black, white and gray.This pattern was hand designed by a professional artist/crafts personFinished size is approximately 8.5" wide x 11" high when worked on 14 count .. 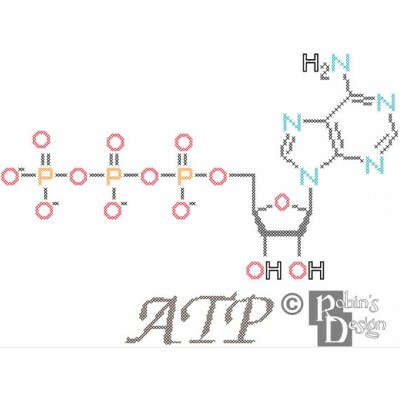 This is an accurate depiction of the molecular structure of adenosine triphosphate commonly called ATP. The pattern can be stitched as shown, or if you want to be more subtle, without the letters "ATP" at the bottom.This pattern was hand designed by a professional artist/crafts personFinished size i.. 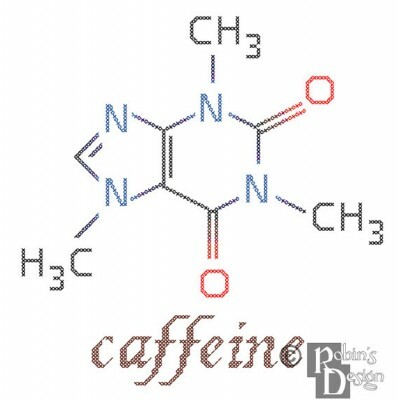 This is an accurate depiction of one of the most important fuels of human beings, the caffeine molecule.This pattern was hand designed by a professional artist/crafts personFinished size is approximately 8"x 8.5" when worked on 14 count fabric (113x119 stitches) The image is composed of 11 colors. .. Some like it hot. 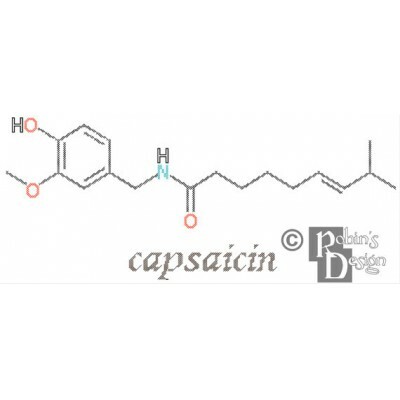 This is an accurate depiction of the molecular structure of capsaicin. This is the molecule that makes peppers spicy. The pattern can be stitched as shown, or if you want to be more subtle, without the word "capsaicin" at the bottom.This pattern was hand designed by a profession.. 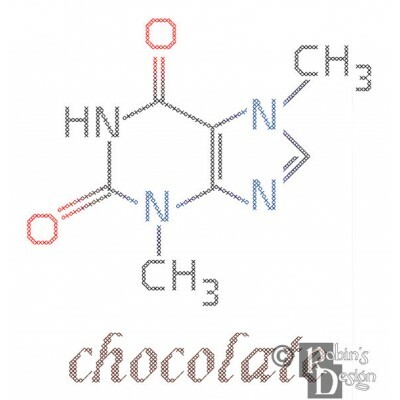 This is an accurate depiction of the molecular structure of one of the major food groups--CHOCOLATE! The pattern can be stitched as shown, or if you want to be more subtle, without the word "chocolate" at the bottom.This pattern was hand designed by a professional artist/crafts personFinished size .. 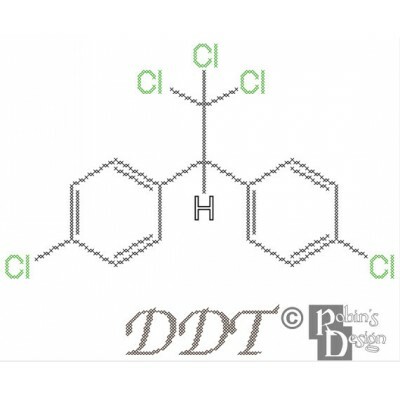 This is an accurate depiction of the molecular structure of dichlorodiphenyltrichloroethane better known as DDT. The pattern can be stitched as shown, or if you want to be more subtle, without the letters "DDT" at the bottom.This pattern was hand designed by a professional artist/crafts personFinis.. 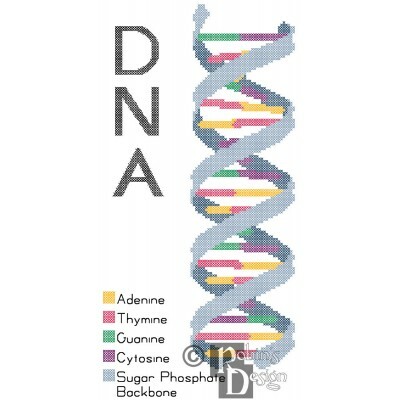 Accurate depiction of a strand of DNA. Pattern can be stitched with or without the text.This pattern was hand designed by a professional artist/crafts personFinished size is approximately 6" wide x 12" high when worked on 14 count fabric (83 x 165 stitches) The image is composed of 7 colors. 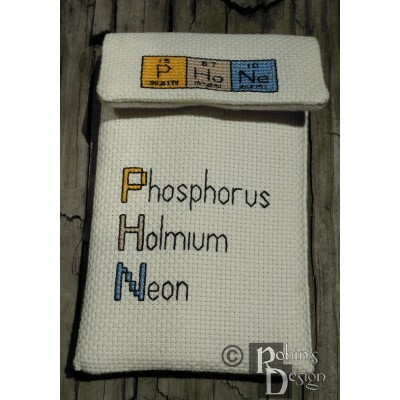 THIS I..
Three elements accurately drawn from the periodic table spell the word "phone" for this adorable cross stitch pone case. Best of all, it makes a case able to fit phones up to 5.5" high x 3.25" wide x .75" thick. The back shows the word "phone" the front names the elements and the flap repeats the.. 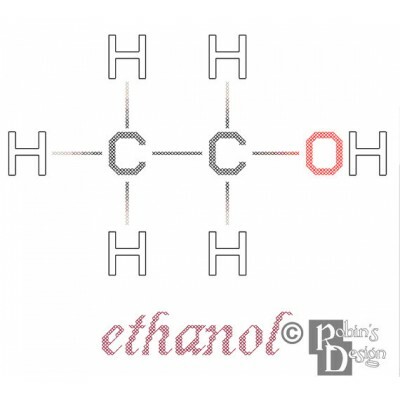 This an accurate depiction of the molecular structure of a very versatile and important chemical--ethyl alcohol. Just think of all the joy (and pain) brought about by this wonderful molecule. 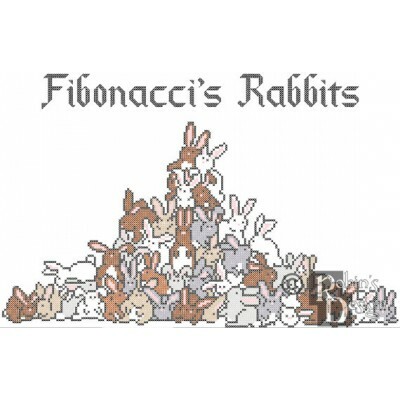 This pattern can be stitched as shown, or if you want to be more subtle, without the word "ethanol" at the..
Rabbits, lots of rabbits.This pattern depicts the puzzle posed in 1202 by Leonardo Pisano Bigollo, better known as Fibonacci. In an ideal world a newborn pair of rabbits, one male and one female, are put into a field. They can mate at one month and she can give birth at two months. Each time they.. 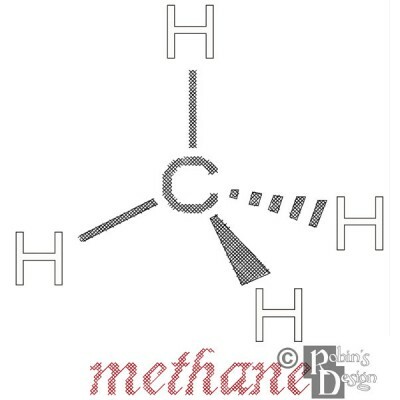 This is an accurate depiction of the molecular structure of methane. This is, of course, the gas behind (yup, I said it) farts. 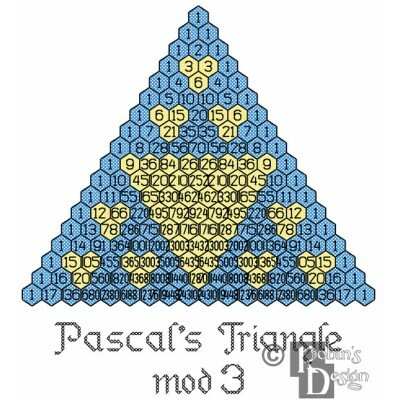 The pattern can be stitched as shown, or if you want to be more subtle, without the word "methane" at the bottom.This pattern was hand designed by a professional artist/c..
Pascal's triangle is a triangular array of binomial coefficients. It is named after the french mathematician Blaise Pascal and first published in 1665. Pascal used his triangle to solve problems in probability. The triangle is constructed of rows starting with row 0 on top with the number 1. 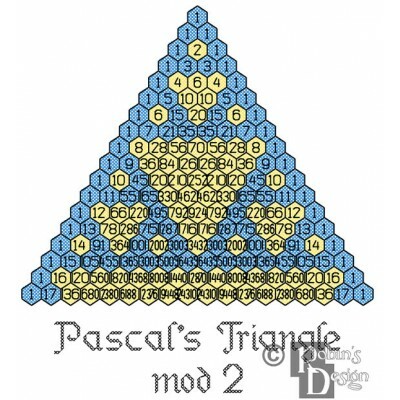 Row..
Pascal's triangle is a triangular array of binomial coefficients. It is named after the french mathematician Blaise Pascal and first published in 1665. Pascal used his triangle to solve problems in probability. The triangle is constructed of rows starting with row 0 on top with the number 1. 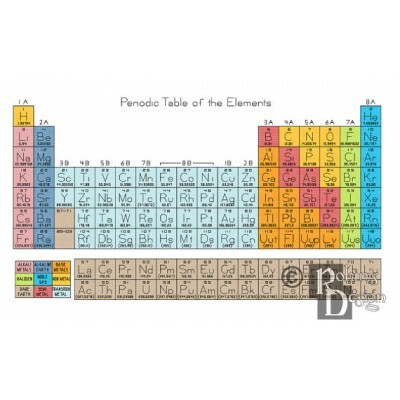 Row 2 a..
Revised 2013 to reflect the new names for elements 114 and 116 (Flerovium & Livermorium)This is an accurate pattern of the periodic table. 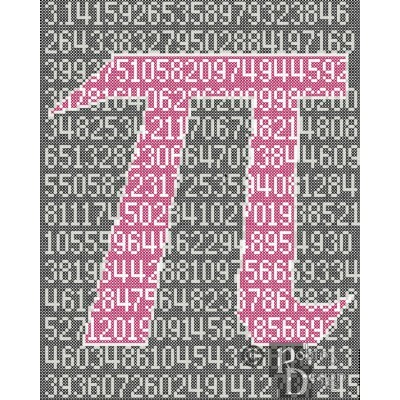 It is depicts the groups, periods, categories, element symbol, atomic number and atomic mass.This pattern was hand designed by a professional artist/crafts pe..
Have you ever wanted to memorize pi to the 304th decimal place? Maybe this cross stitch pattern will help. Between sewing it and then having the finished work hanging on the wall or sitting on the sofa as a pillow, it just might get driven into your memory bank.This pattern was hand designed by a ..